This popular ramen joint group continues the expansion with its fifth Bone Daddies in the capital (not counting Flesh & Buns in Covent Garden and Shackfuyu in Soho, which are run by the same folk). Giving a New York edge to Japanese cuisine, Bone Daddies is known for its rock 'n' roll soundtrack and street-vendor aesthetic. This branch, which is walk-in only, is split over two floors, with an open kitchen downstairs and lots of timber and metal materials. Food comes in the form of wok-fried noodles, or tonkotsu broth. They also specialise in skewers robata-grilled (slow grilled over charcoal) here, featuring chicken, ox cheek, prawns and shiitake mushrooms in such marinades as kimchee butter and sweet chilli ponzu. I have to say I don't see appeal. I'm not the biggest fan of Ramen but enjoy Poke and have to say it was probably one of the worst I've had. Mostly bland with one very over powering flavour of seaweed, the supposedly spicy dish was not spicy in the slightest. The restaurant itself is OK, if a bit dimly lit, so the only saving grace were the staff. Friendly and attentive, I just wish the food was better. I don't plan on going back. I skipped the famous ramen and had fun with the little bites - I just loved the spicy edamame and the colourful buns. 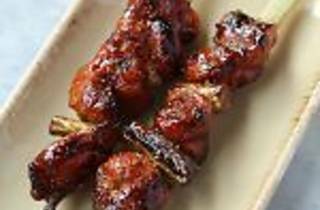 The skewers had ups and downs, and were a bit on the dry side to my taste, although the flavour was still there. We also shared the yaki soba dry noodles with shitake and veggies which was absolutely delicious, with a bite to it and great looks as everything they serve. Must come back to try the ramen, and would recommend it as a fun place for a sharing lunch (high chairs sharing tables kinda place, so maybe not too comfy for dinner)! Used to come here a lot but it's out of my way now... The Raman is absolutely great, starters as well. The ingredients are freshly sourced and made, you can tell by the colours and spectacular flavours. They even have an incredible green tea ice cream that they homemake in a very special machine, visible to customers.